format : digipack CD, black vinyle LP, limited edition gold vinyle LP. 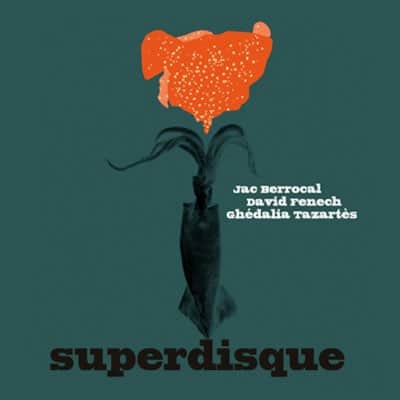 Superdisque is the one and only album of the French trio formed by David Fenech (electric guitar) with Jac Berrocal (trumpet) and Ghédalia Tazartès (vocals). This album is like a musical travel in sounds, with the unique signature of these three musicians. Somewhere beyond the borders of rock, jazz, punk and sound poetry… The vocals seem to come from another planet, with lyrics in an improvised language. The winds are blown from Tibetan human bones and conch seashells. Guitars sound like rubber and steel. The album comes in two versions : a limited edition LP and a CD (including a special bonus track by David Fenech + Jac Berrocal). Special guest Zap Pascal (accordion) appears on one track. Ghédalia Tazartès is an orchestra and a pop group in one person. His voice shifts constantly from child to diva, from African sorcerer to Tibetan monk. His hypnotic, disturbing polyphonies draw us into an emotional universe. It’s punk, sound poetry, Folklore and electroacoustics rolled into one. Ghédalia has been recording music in his Parisian home studio for more than 40 years. He has also worked for theater (La Comédie Française), dance and more recently for cinema. Both Jac Berrocal and Ghédalia Tazartès appear on the famous? “Nurse With Wound list“. Like a French BLT. 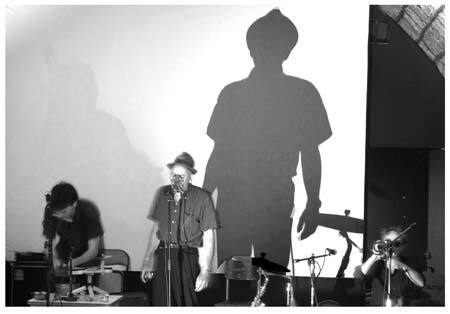 David Fenech (electric guitar), Jac Berrocal (trumpet) and Ghédalia Tazartès (vocals) create a sound world that’ll make David Lynch’s hair stand on end. Tribal existential industrial found jazz folk rock. Feed your head. This cooperation between electric guitarist David Fenech (Felix Kubin, Tom Cora), trumpetist Jac Berrocal (Pascal Comelade, Jaki Liebezeit, Nurse With Wound, Sunny Murray, Pierre Bastien, Lol Coxhill) and Ghédalia Tazartès has somewhat in common with some of the improvised works I have heard from some Tuvan/Russian shamans with accompanying bands. Ghedalia’s voice has something of such a shaman, a throat singer with deep vibrations in his voice, in other times he sounds if he slowed down some Bulgarian folk chant. David Fenech’s guitar opens up spaces freely, adding the rhythm to the magical atmosphere, while Jac Berrocal’s trumpet adds moods in the deeper spaces themselves. Besides that, there are a few other instruments to be heard like accordion, slowly dancing with the atmosphere a bit, or some strange whirly sounds. It is said that there are used some sounds come from Tibetan human bones and conch seashells. This is not entirely a complete freedom of inspiration. There are definite separate areas. There occur tendencies to real singing, on track five with certain emotional strength too. And the others participate with their voices to as close to Ghedalia’s vocal approach as they can. On the tenth track the shamanic association comes even closer in mind, when using the powwow as a rhythmic drive. The ninth track, “Jac’s Theme”, was the track where I was reminded of the slowed down Bulgarian folk, confirmed by the melody of the trumpet theme. The album comes to concrete ideas enough to be convincing as an experience having found shortly a new area to explore. Really loose but truly ominous improv that is almost rock, & just generally feels upsidedown & backwards like nothing else. 70s anti-idiomatic progster Jacques Berrocal plays a very wet trumpet, human bones (! ), toy piano, water, & shells. Contemporary guitarist David Fenech mostly provides a backbone, but sometimes turntables, ukulele, gamelan, sampling. However it’s of course musique concrete looper Ghedalia Tazartes who makes the craziest noises, throat singing, wailing & sometimes playing accordion. Supergroups can be a bad idea, but this holds it’s own ground somewhere between what all 3 guys do. Superdisque is een samenwerking tussen drie Franse avant-gardepioniers. Fenech – bekend van samenwerkingen met onder meer Felix Kubin, Jad Fair en James Plotkin – bedient zich van snaren (oed, ook wel oud genoemd, elektrische gitaar, Spaanse gitaar) gamelan, samples en percussie. Trompettist Jac Berrocal trad reeds in het voetlicht door samenwerkingen met een brede waaier aan baanbrekende muzikanten, waaronder Jaki Liebezeit (ex-Can), James Chance en Nurse with Wound. De vocale inbreng van Ghédalia Tazartès drukt de grootste stempel op deze samenwerking. Deze merkwaardige oude man is in staat om met zijn stem van het ene extreme in het andere te vallen. Hij manoeuvreert tussen opera, Tibetaanse gezangen, kamermuziek en drones en boort liefst al deze vaatjes gelijktijdig aan. Die aanpak documenteerde hij overigens treffend op zijn recente solo-uitingen, Ante-Mortem en Repas Froid. Superdisque klinkt als de som van de reeds beschreven delen, waarbij de drie musketiers elkaar perfect in balans houden. In tegenstelling tot Tazartès’ solowerk legt Superdisque meer de nadruk op melodie en ritmiek, terwijl de vocale gekte slechts een van de elementen is die in de composities ingepast wordt. Het geheel is consistent doch moeilijk onder een noemer te vatten. Het schippert tussen jazz, rock, punk en spannend experiment, zonder in vrijblijvendheid te vervallen. Superdisque is een muzikale speeltuin waarin drie spannende muzikanten de krijtlijnen uittekenen en waar het heerlijk toeven is voor de nieuwsgierige luisteraar. Zowel de cd als de vinyluitgave bevat extra materiaal. Zo sluiten Berrocal en Fenech de cd-versie af met een beklijvende instrumental. Superdisque est un disque super. Pas facile, intemporel (déjà), râpeux, kafkaïen voire schultzien (Bruno, pas Klaus) et qu’on range d’emblée du côté des grands disques. Il y a de la trompette, la voix terrible de Tazartès, l’univers tendu de Fenech. On met le disque en route et on écoute. Ça tombait bien ( ! ) : victime d’une pneumopathie retorse, j’étais après (comme on dit) me faire une inhalation avec le truc bleu. Du coup j’ai vraiment écouté. Et du coup je puis vraiment attester : ce disque est un putain de sacré bon disque. Respect, Messieurs. PS : le graphisme, le visuel, sont excellents. Super record indeed! A collaboration that matches the expectations that arise when juxtaposing on the same artist line the names of Jac Berrocal, David Fenech, and Ghédalia Tazartès. Improvised songs, with Tazartès mainly on vocals, Berrocal mainly on trumpet, and Fenech mainly on electric guitar, turntable, and small instruments. A fun, puzzling, and marvelously subversive record. The record starts of with deep, dark singing called throat-singing. Throat-singing is a very peculiar type of singing that they do in Tuva and Mongolia (see video below), I like this throat-singing very much and there is lots of it on this CD as well as other interesting ways of singing. As well as the funny singing on this song there is trumpet and noises like a ships funnel which I think is made with guitar, it is quite a noisy, chaotic song and fun to listen to, it doesn’t really sound like anything I’ve ever heard before. The next song Human Bones is another weird and funny song with more throat-singing in it. It is called Human Bones because instead of trumpet the trumpet player plays real human bones, this is a bit comical and I think it’s ok to use human bones as an instrument – some people might not like this because the bones would come from a dead person but I wouldn’t mind someone playing my bones after I died because I’d already be dead so I wouldn’t feel anything. Next after Human Bones is Cochise and in this one the vocals sound like someone shouting and moaning a bit like someone who has died and come back to life again. There is trumpet and drums (maybe bongo drums) on this one and it would be quite a good song to play at a Halloween party if you wanted to scare people. We had a Halloween party here at the Gate and the arts group made body parts to hang from the ceiling for it and we danced to some music and had sausage rolls and crisps and stuff to eat, it was a very good party. The next song is called Quando and has some good accordian playing in it and also ukelele and toy piano. This song has more normal singing on it and no throat-singing but it is still very nice and good to listen to and it sounds very french to me because of the accordion but I think the words are in Italian not French because Quando is the Italian word for when. Next is David’s Theme which again is very strange; on this one the trumpet player plays a sea shell as well as a trumpet which I think is a very clever idea. The singing on this is very interesting too; it’s a bit like throat singing because it is very deep but It’s not quite the same and sounds a bit like Popeye singing or sometimes like an animal, maybe a cat, crying in agony. I liked this one lots even though I’ve never heard anything like it before. After this is Ife L’Ayo which starts off with Jazzy trumpet like you used to get in old dance-halls and other sounds like people marching to war then there is some different music made of music boxes and singing which sounds a bit like people with learning disabilities singing before it goes back to the dancehall trumpet. Porte De Bagnolet is the next song and sounds like Indian music to me; like you might hear in a Hindu temple – it is a very curious song with more throat-singing in it and something like a flute and bongo drums and screaming like somebodies wife or daughter has died and accordion and bird-song and jungle noise all mixed up, I liked this one a lot. The next song is called J’attendrai and is a slow one with vocals like somebody crying and sad sounding trumpet playing, it sounds a bit like a song you would play if you were upset because somebody died or because your wife has left you. After this is another sad sounding song which reminds me a bit of a church service because it has noises like bells in it made by a gamelan which is an instrument a bit like a xylophone. This one has more throat-singing in it and more unhappy sounding trumpet – I think the trumpet goes very well with the throat-singing on this one. Powow is the next song and has a big, deep drum running through it which sounds like a Native American war-drum and singing like Red Indians on the warpath and after this is a song called Sainte which is another sad sounding song that reminded me of death again. After all this sadness though is a happier sounding song with lots of accordions in it and very joyous singing and mad drumming which made me laugh. This would have been the last song but there is an extra track on the CD of just the guitar and trumpet player playing together, it’s quite a noisy track and I thought it was very nice to listen to and a good way to finish the CD. Overall I would say that I thought this was a very, very strange and wonderful disc. I especially liked the throat-singing and here at The Gate me and my friend Francis tried it out ourselves as can be seen in the video at the end of this review. I would give Superdisque 10 out of 10 and I hope lots of people buy it. Es gibt Alben, die sind schwer einzuordnen. Ist es jetzt eher Punk oder eher Rock oder Indie oder eher Electronica? Und dann gibt es Alben wie Superdisque, die sind unmöglich einzuordnen. Ein Gitarrist (David Fenech), der irgendwo zwischen Punk, freiem Jazz und Avantgarde steht, ein Sänger (Ghédalia Tazartès), dessen Gesang zwischen Kinderlieder und freier Improvisation, zwischen arabischen Balladen und tibetanischem Mönchsgesangs, zwischen Avantgarde und Archaik hin- und herpendelt, und ein Trompeter (Jac Berrocal), der seine Trompete manchmal als herrlich-singende Engelstrompete, manchmal als röhrend-animalisches Organ, manchmal als reiner Geräuschproduzent benutzt. Ist es Jazz, Avantgarde, eine Art progressiver Ethno-Folk, neue Musik, Soundart? Auf jeden Fall ist es erstaunlich, wie viel verschiedenes die drei französischen Musiker auf Superdisque (veröffentlicht auf Sub Rosa) unter einen Hut und in dreizehn Stücke gebracht haben. Meditatives Sound-Aufschichten (“Joy Divisé“, “Human Bones“), verstörende Klangcollagen (“Cochise“), schräge Folk-Chansons (“Quando“), klaustrophobische Stimmungsbilder, die einem David Lynch-Film entspringen könnten (“David’s Theme“), humorvolle Volkslied-Parodien (“Ife L’Ayo“, “Final“), stimmungsvolle Klanglandschaften (“J’attendrai“, “Sainte“), indianische Ritualgesänge in das 21. Jahrhundert projiziert (“Powow“) und massive Klangmauern (“Ziveli“). Die drei unkonventionellen Musiker bleiben auch nicht bei ihren herkömmlichen Instrumenten: Die verschiedensten Instrumente wie Akkordeon, Kinderklavier, Ukulele, Oud, Gamelan und verschiedene Perkussions-Instrumente, aber auch eher seltsame Klangerzeuger wie Turntables, Muschelschalen, Spielzeuge, Musikbox, Wassergeräusche und sogar menschliche Knochen (es steht ausdrücklich “Human Bones“) kommen zum Einsatz. Auch ein Featuring ist darauf zu finden: Für “Porte de Bagnolet“ haben sie den französischen Akkordeonist Zap Pascal eingeladen, der das atmosphärisch dichte und intensive Stück mit seinen reduzierten Klangflächen und Melodiefragmente würzt. Man hört sicherlich, dass sich hier drei äusserst interessante und eigenständige Personen der französischen Avantgarde-Szene zusammengefunden haben. Ghédalia Tazartès ist zwar nicht sehr bekannt, doch seine eigenwilliges Organ, ständig wechselnd zwischen Kind und Diva, und seine unkonventionelle Art Musik frei von jeglichen Genre-Grenzen zu machen, hat ihn inzwischen zu einer Art Kultfigur gemacht. Mit seinem Mix aus dem archaischen, manchmal fast schamanischen Ausdruck seiner Stimme und der experimentellen Montage und progressiven Arrangements ist er zu folkloristisch, zu wenig “neu“ für die Avantgarde-Szene und viel zu schräg und zu experimentell für einen eher ethnologisch geprägten Kanon. David Fenech und Jac Berrocal hingegen sind ziemlich fest in der europäischen Avantgarde-Szene irgendwo zwischen Jazz, Rock und zeitgenössischer Musik, verwurzelt. Beide haben sicher schon ein Duzend Alben Solo und in unterschiedlichen Kollaborationen veröffentlicht. David Fenech spielte unter anderem schon mit Felix Kubin, Gino Robair, Tom Cora, Rhys Chatham und anderen und Jac Berrocal arbeitete schon mit Pascal Comelad, Nurse With Wound (aka Steve Stapleton), Jaki Liebezeit von der deutschen Band Can, Sunny Murray, Lol Coxhill und anderen zusammen. Ein interessantes Trio ist hier entstanden und ein äusserst vielseitiges und auch ambivalentes Album. Einerseits durchaus der E-Musik – inklusive dem Einsatz von Samples, freier Improvisation, Klanggedichten und Soundscapes – zuzurechnen, andererseits – durch den teilweise komisch anmutenden Gesang von Tazartès und den schrägen Folkeinflüsse und Kinderlieder – sehr humorvoll. Einen strengen Verfechter von konzeptioneller E-Musik sowie einen eher konservativ eingestellten Volksmusiker wird dieses Album wohl vor den Kopf stossen. Doch wer es sich mit offenen Ohren und einer gehörigen Portion Humor anhört, wird den Reiz dieser ungewöhnlichen Kollaboration sicher entdecken. Guitare préparée, platines, microphone, trompette, électricité, coquillages-conches, voix et surprises. Voilà l’arsenal de ce trio pour un disque ethnique des temps moderne où l’on croise l’ombre des indiens, de Miles Davis, de Pascal Comelade, Piaf ou encore de David Thomas (chanteur de Pere Ubu).. Des multiples résurrections sonores. Des poursuites lumineuses en pointillé imaginées à la trompette. Un parcours vocal scotché pour les performances scéniques. C’est un disque qui réussit le tour de force, à la fois de conserver de la bizarrerie et de proposer un imaginaire étonnamment efficace. Un jeu parcouru d’un humour iconoclaste. Paradoxalement aussi carré que complètement décalé ou improvisé. On vous conseille d’aller s’y frotter. Ne serait ce qu’une fois..
il superlativo del titolo non è mio, pur condividendolo appieno; battesimo sinceramente immodesto e scomodo come questi tre musicisti lo sono per la musica contemporanea. un supergruppo per realizzare un superdisco: come nei sogni malsani degli avanguardisti più intransigenti. in realtà i tre mescolavano già da un paio d’anni i loro deliri sui palcoscenici d’europa frequentando festival e club abbarbicati al limite del continente. dopo alcuni video trapelati dal colabrodo della rete e qualche registrazione clandestina ecco dunque giungere il superdisco accasato, manco a dirlo, per la prestigiosa etichetta belga Sub Rosa. che succede dunque quando le peregrinazioni immaginifiche di Jac Berrocal si incontrano con quelle di David Fenech passando per le corde vocali dell’illustre Ghédalia Tazartès? capita che si venga trasportati in un non-luogo indefinibile da meridiani e paralleli e pure da clessidre: assomiglia all’avamposto spinto ai confini delle nostre frontiere ignaro del fatto che non vi sia più nulla da difendere o da esplorare dopo che tutto è divenuto dopo, post. oltre i suoni delle avanguardie, oltre la forma canzone, oltre le tradizioni popolari e oltre il linguaggio e le sue forme. Superdisque (Sub Rosa, 2011) arruola la tromba di Berrocal assieme alla chitarra di David Fenech a dividersi i turni di guardia con i deliri di Tazartès. loro tre a presidiare l’avamposto servendosi di ammenicoli e brandelli di memorie sonore, stralci di un tempo passato, ricordi. di notte, nel cabaret del refettorio i tre improvvisano ballate e canzoni mal digerite servendosi del generatore che sputa l’ultima corrente elettrica disponibile. bagatelle dopo il massacro, rigurgiti di blues, reticenze free si mescolano con incedere marziale a ricordi popolari, canti di pastori erranti, agli ultimi sussulti silicei di qualche congegno elettronico. Ghédalia Tazartès mugugna la sua lingua ieratica e inesplicabile sopra tappeti di blando stordimento elettrico. lingua incongrua, spuria, che solo a tratti rammenta quel francese malsano biascicato nei sogni sudati al chinino nel deserto africano dei legionari. ma la sensazione di trovarsi esattamente da nessuna parte persiste: un piccolo aleph malato. una piccola cosmogonia portatile di sciamanesimo da consultare ogniqualvolta assale la sensazione di smarrimento e di perdita, una mappa per conoscere le transumanze dei popoli ben prima che tutto venisse spazzato via inghiottito in un niente assordante. si potrebbe definire disco dell’anno se solo si sapesse in che anno ci si trova. tempo indefinibile, imprendibile nello spazio circostante che si scruta dalla garitta. Superdisque appunto. L’homme à la poésie aussi étrange que sa voix est versatile, Ghédalia Tazartès, s’est accoquiné avec deux francs-tireurs notoires, le guitariste David Fenech et la légende de la trompette hallucinée Jac Berrocal pour un Superdisque, c’est le nom de l’album, chez Sub Rosa, qui concrétise leur rencontre il y a deux ans autour d’un projet au Museo Vostell Malpartida de Cacerès. Un disque ovni comme la somme de trois passionnants passionnés. With Ghédalia Tazartès on board, this debut release from a French trio feels more like an ancient missive from a lost tribe of antediluvian outsiders. With chameleonic ease, the veteran vocalist shifts from cracked muezzin to lost child, from senile warble to insane muttering, while, on “Human Bones”, eldritch, Tibetan-style throat singing (accompanied by Berrocal’s windy blasts played on actual human bones) conjures a chilling fanfare like a message from remote ancestors. If Fenech’s electric guitar textures sit less well with the feeling of antiquity, it all comes together more convincingly on pieces like “David’s Theme”, with simple, resigned strumming, Berrocal’s forlornly distant trumpet and Tazartes’ impossibly sad croon. Overall, there’s a quaintly post-apocalyptic vibe to these warped chansons – as if the three musicians are vainly trying to remember old song-forms through a fog of radioactive confusion. My record of the year. Head-splatteringly tasty and touches all the right spots. Jac Berrocal, David Fenech et Ghédalia Tazartès, trois musiciens résolument inclassables, ont fait équipe pour une expédition aux confins du monde connu, presque aussi chamanique que sonique. Le fruit de leurs efforts porte un titre tout à fait idoine : Superdisque. Ça commence comme une fuite en avant sur une autoroute subliminale, celle de Maurice Ronet dans Ascenseur pour l’Echafaud, où se superposeraient, sur les phrases éruptives de trompette de Miles Davis, les décors fantomatiques d’un folklore mutant, fait de collages post-punk (le bien-nommé « Joy divisé »), d’embardées vocales (« Human Bones », « Cochise ») et de folk tzigane (« Quando »). Il faut dire que cet attelage musical insolite, loin de toute formule convenue, dispose des meilleurs arguments pour confondre l’auditeur, vu le trio d’illuminés qui le compose. Le guitariste David Fenech, militant d’une alternative punk concrète l’ayant vu fourbir ses accords tronqués aux côtés de musiciens aussi divers que Tom Cora, Rhys Chatham, Ergo Phizmiz, Felix Kubin ou Bérangère Maximin, distille des lignes de guitare, et d’autres mini-instruments épars (le gamelan frétillant du « Jac’s Theme »), aussi onduleuses qu’une crête de vague traîtresse. A ses côtés, le trompettiste Jac Berrocal, l’un des trois piliers (avec Jean-François Pauvros et Gilbert Artman) du groupe de rock avant-gardiste Catalogue, trublion impénitent ayant essaimé aux côtés de visionnaires comme Pascal Comelade, Jaki Liebezeit ou Steven Stapleton (Nurse With Wound), impulse ses courbes cuivrées aux litanies changeantes, tour-à-tour féroces et vibrantes, ou plus mélodiques et brillantes (« Ife l’ayo »). Toutefois, dans ce trio déjà sur pied depuis deux ans et dont ce Superdisque constitue la première sortie discographique, se fait plus particulièrement ressentir la marque du poète sonore Ghédalia Tazartès, qui imprime ses motifs hululant sur la trame de morceaux en gestation constante. Sur des titres comme « David’s Theme », les incantations tibétaines de Ghédalia Tazartès, évocations ritualisées d’un Livre des Morts ouvert sur sa page la plus sibylline, se rapprochent des vocalises étouffées d’un Captain Beefheart période Mirror Man. Sur « Porte de Bagnolet », ses jeux de respiration à l’envers prennent à contre-pied les tonalités hirsutes de trompette de Jac Berrocal et les touches chatoyantes d’un accordéon souvent invité dans ce halo sonore, offrant la vision fugitive (et presque récurrente tout au long du disque) d’une « zone » banlieusarde parisienne réinventée. C’est justement dans cette grande variabilité que Superdisque brille de mille feux trompeurs. Chaque morceau semble disposer de sa vie propre, évolue presque de lui-même au fil d’une écoute qui reste, du coup, aussi attentive qu’incertaine, comme lorsque les paroles du « J’attendrai » d’Edith Piaf viennent se greffer au titre du même nom. Ainsi s’exprime toute la puissance d’un disque vraiment super, et empreint d’une intense poésie urbaine. Il mio “superdisco” dell’anno. 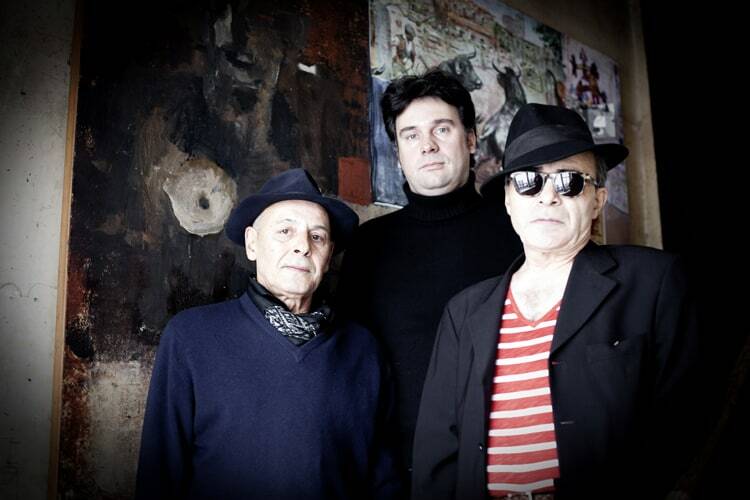 Superdisque è il primo album del trio francese formato da David Fenech (chitarra elettrica),Jac Berrocal (tromba) e Ghédalia Tazartes (voce). Da qualche parte oltre i confini del jazz, rock, punk e poesia….. La voce sembra provenire da un altro pianeta, con testi in una lingua improvvisata. Così preannunciava il sito della Sub Rosa…..e io sono rimasto folgorato da questo disco che ascolto in continuazione da due settimane. Un’opera che ti lascia dentro un senso di meraviglia che si prova quando si ascolta qualcosa di grande e inafferrabile. O meglio: straordinario e inclassificabile. Trois géants de la scène expérimentale française se réunissent pour faire un “superdisque”. Rien de moins. Debut parížského tria je pretaveným amalgámem rocku, tradicního francouzského folku, punku i sound poetry. Už jen z výctu nástroju je evidentní, že jde o pestré album: Jac Berrocal (trumpeta, tibetské lidské kosti, morská lastura, akordeon…), David Fenech (kytary, ukulele, zvony, samply, gamelan…) a Ghédalia Tazartès (vokály, akordeon, tradicní buben bendir…). Hned úvodní skladba nahání husí kuži. Tazartès zní jako mongolský hrdelní pevec, Fenech jako by chtel navodit jednoduchými akordy náladu z Jarmuschova Mrtvého muže a Berrocal trubkou s dusítkem dokonale dokresluje zastrenou atmosféru. Následující skladba se jmenuje Human Bones a už název mluví za vše; strašidelnou atmosféru umocnuje nejen naefektovaná trubka, ale i rituálne zacyklený gramofon ve Fenechových rukách. Náhlá zmena, a clovek neví, zda poslouchá (francouzsky zpívajícího) Jima Certa, kterého doprovází Berrocal na detské piánko, nebo jestli je soucástí nejakých bizarních cernomagických operací. Doslova a do písmene Superdisque. Jedním z vrcholu je bezpochyby skladba, v níž Tazartès kolísavým chraplákem „recituje“ Mallarméovu Svetici. Ale vrcholu je tahle petactyricetiminutová superdeska plná! Superdisque is incredible! Really, whata gem! Il y a de la générosité, de la maturité, de la maitrise, de la tranquillité ou plutôt de l’assurance dans ces enregistrements. Pas de bluff, pas de surenchère, pas de couardise. Si on additionne (et on soustrait) tout ça, ça fait un sacré bon album. De plus la production est parfaite, alors ! l requisiti d’eccentricità attesi da una collaborazione tra personaggi del calibro e della personalità di Tazartés, alla voce, Fenech, alla chitarra elettrica e Berrocal, fiati, tra cui ossa umane, non tardano a manifestarsi in “Superdisque” sin dall’incipit di Joy Divisé, con le vocalità lugubri di Tazartés rischiarate dai fremiti free della tromba di Berrocal. Le significative componenti rituali di Cochise, un accordion sapido di reminiscenze balcaniche, a riaffacciarsi poi in Final, che viaggia nella polverosa Quando, David’s Theme intrisa di cinematiche nostalgie retrò, l’incorporeo fermento di J’attendrai, l’intreccio tra tromba, gamelan e sciamanismi di Jac’s Theme, echi di canti di nativi americani in Powow, e una non meno interessante Zilveli, dalle venature oscure, proposta come bonus track alla fine del programma poichè frutto del duo Fenech / Berrocal, segnano un percorso avant accidentato e coinvolgente. C’est bien un Superdisque qui réunit trois figures inclassables de la musique alternative en France. Un trio de tous les possibles. Du jazz not jazz au freak rock en passant par la poésie d’inspiration traditionnelle et le jeu de l’improvisation sur des objets sonores tels que des os humains du Tibet et des coquillages. Trio perméable à diverses cultures, chamanique, tibétaine, francilienne, catalane, andalouse, maghrébine… mélangeant les techniques : électronique artisanale, acoustique la plus sobre, électricité et folie douce. Tazartès chante dans sa langue propre traversant plusieurs traditions, visité par les anges, le chamane ou le cante flamenco. Ghédalia flotte, gargouille et improvise, instinctif, hanté par son héritage Ladino (communauté juive de Turquie). Il manie aussi le Bendir (tambour sur cadre, nord africain) et l’accordéon. La trompette est l’instrument de prédilection de Berrocal, mais attention, en 1975 il enregistrait avec Vince Taylor (voir « Parallèles » et « Fatal Encounters »), en 1980 avec Nurse With Wound et il a aussi joué avec l’enragé new yorkais James Chance, l’improvisateur guitariste Jean-François Pauvros (voir « Pénétration »), avec Yvette Horner en 2001 et tout récemment avec le nomade Aki Onda dont témoignera un LP à paraître en 2012, « Un Jour Tu Verras ». Tout ça pour dire que Berrocal, on n’en fait pas le tour en une phrase. David Fenech, le plus jeune larron (né en 1969) n’est pas en reste. Dans cet album-ci il porte les deux autres musiciens par un jeu approprié de guitare électrique, mais aussi de ukulélé, oud, platines ou quelques jouets et s’amuse à concevoir des rythmes gamelan ou plus électro. Dans le passé il a joué avec Tom Cora, Félix Kubin, Jad Fair ou James Plotkin. Nous vous suggérons par exemple son second album solo « Polochon Battle » où il mène une bataille d’oreillers « toy pop et anti-techno » avec ses invités, dont Felix Kubin. Sans blague, Superdisque s’écoute en boucle sans perdre de sa magie simple et de son charme indescriptible. On peut faire un parallèle entre Berrocal, Fenech,Tazartes et Romano, Sclavis, Texier. Trois personnalités fortes, une base jazz, une volonté de métissage world. Pour le trio qui nous préoccupe ici, la vision musicale est encore plus originale et fondamentalement radicale. Il y a un vrai parti pris et celui n’est pas amené par la trompette entre cool et free de Berrocal (membre de Catalogue), ni par la guitare de Fenech amenant une électricité larvée à la musique (le côté avant-rock du disque), ni même par tout le jeu des percussions et les accordéons qui donnent une touche éthnique bigarrée à la Pascal Comelade ou à ses suiveurs nippons de Pascals (l’ambiance tzigane de Quando). On s’arrêterait là et on aurait déjà affaire à un disque particulier. Mais qui dit trio dit troisième larron et c’est effectivement Ghedalia Tazartes qui transporte Superdisque dans la case des albums ovni. Orchestre à lui tout seul, Tazartes module sa voix dans des polyphonies singulières : il se change en shaman apache (Cochise) ou en diva délurée, passe du guttural au fluet avec une facilité déconcertante. Il implose le classique d’avant-guerre J’attendrai de Rina Ketty dans une version qui semble ralentie en 16 tours et d’un autre côté prend un maniérisme de chanteur réaliste sur Sainte sur un texte de Stéphane Mallarmé. Sa présence est tout sauf neutre et pourra causer le rejet. En revanche, si l’auditeur arrive à apprivoiser ces voix hors-normes et aime errer entre squat berlinois, tipi indien et ashram tibétain comme nouvel espace imaginaire, alors Superdisque peut devenir une invitation au voyage pour une transe envoutante. A sa manière, un vrai disque punk. Superdisque Ziemlich eigenwillige und sehr sehr schöne Musik zwischen Chanson und Folk-Gebimmel, schartiger Punk Gitarre, Jazz, Klangkunst und bestimmt noch so einigem mehr. Fenech fährt zwischen Gitarre, Gamelan und Platlenspielern, Schlagzeug und Gekloppel die Grundlage für den Gesang von Tazartes auf, der die Gesangsstile zwischen schamanistischem Gegrummel, trankophilem Schmachten, bedrohlichem Flüstern, schratlgen Schreie und Kehlkoptobertongesang wechselt wie andre Leute das Hemd, Trompeter Berrocal gibt dazu seine an Miles Davis geschulten Phrasierungen. Nog immer strijdend tegen het veelkoppige monster van de mainstream hebben Jac Berrocal, Ghédalia Tazartès en David Fenech zich hier verenigd voor een zoveelste offensief. Waar Berrocal en Tazartès lang genoeg dienen om een plaatsje te hebben verworven op de legendarische Nurse with Wound lijst, is de wat jongere Fenech een welkome aanvulling. Op Superdisque is haast geen saai of overbodig moment te vinden. Dertien juweeltjes lang worden we gefêteerd op mooi gedoseerd trompet- en accordeonspel van Berrocal, het stemgeluid van een kreunende en steunende Tazartès en de inkadering daarvan door multi-instrumentalist Fenech, hetgeen resulteert in een volwassen klinkend geheel, dat wellicht ooit hun magnum opus zal worden genoemd. Ik weet niet of iemand zich de strijd tegen de gevestigde orde nog aantrekt, en je kunt ook vraagtekens zetten bij de relevantie ervan. Duidelijk is wel dat hier een op zichzelf staand meesterwerkje is afgeleverd. Avant-garde zoals alleen de Fransen die kunnen maken, met recht Superdisque getiteldDes traits de trompette réverbérée comme des entailles au cutter, des guitares sous crack de la porte de Bagnolet, et le chant de la pomme de terre ébouillantée : au panthéon des grands héros nationaux méconnus, la rencontre entre les fleurs de lys de Berrocal, le communaliste Tazartès et le jeune encyclopédiste Fenech a des airs de retrouvailles touchantes. Trois ovnis dans le paysage français, forts de leurs discographies et bagages respectifs, hybridant conflits ethniques et honnêteté free, mystères jazz et folklore profond. Cloches, soufflets, boucles et sous-couches indéfinissables… Peu de choses sont aussi casse-gueule que l’envie de sonner papou. Ici, malgré quelques sorties de route brièvement embarrassantes, on évite les travers du tribalisme d’emprunt. Plus précisément, l’effet pow-wow – inévitable – semble être le prix à payer pour les moments de grâce, quand la musique réinvente le caractère déclamatif des traditions orales les plus profondes. Portée par ce chant si spécifique à Tazartès, elle s’ancre dans une terra incognita mâle, primitive et mélancolique. La conversation semble dériver paisiblement entre les trois protagonistes, passant naturellement du mélodique à l’atonal, de l’avant-garde au folklore avec une vraie sincérité. Alors certes, les coups tordus restent raisonnables et les conflits d’humeurs en sourdine. La mise en son, élégante, filtre un peu la rugosité, mais chacun est quand même ici visiblement à son meilleur. Les voilà pour certains délestés de leurs ponctuels péchés poétiques, des marottes un peu défraîchies qu’affectionnent forcément tous les grands anciens. Que reste-t-il à faire quand on a sadisé Nurse With Wound et tutoyé Yvette Horner, chanté Michel Chion, bretté avec Jad Fair, passé ses nuits avec Pauvros, Portal ou Marie-France, tué dans les caves avec Mesa of the lost women ? Calme et langoureux, cet album en forme de réponse collective recèle les grandes qualités de ces disques faussement simples : ligne claire classieuse sur fonds d’orage. Superdisque (SUB ROSA SR321) was sent to us in November, an uncanny record made by three towering personalities in Paris and musically occupying a twilight area which somehow includes improvisation, jazz, rock, folk, African and Tibetan music, poetry, pop, sound poetry, and much more. With this release, the strange world of Ghédalia Tazartès is slowly coming together for me. I’m usually stricken by a horrible sense of inferiority when faced with his work because I don’t know anything about the Middle-Eastern musical forms (and presumably many other ethnic sources) that have fed into the mind and body of this astonishing Turkish-Parisian singer, and I look despairingly at my shelves which are sadly unoccupied by items from the Ocora back catalogue. Listening to the uncanny bellows, drones, songs and vocal improbabilities of Tazartès on this record, which the press release helpfully orients with its references to African and Tibetan music, it feels more like the ethnic music of a completely fictional race of human beings – strange shamans, wizards and druids that never actually existed. Maybe it’s more helpful for me at the moment to think of Tazartès as a gifted fiction-writer, a musical version of Jorge Luis Borges who conjures up his impossible visions in sound and music instead of the written word. Certainly the sound poetry of vocalist extraordinaire Henri Chopin is another useful navigational aid for the listener, and few vocal artists took more liberties with “reality” than Chopin, a lyrical fictionist of the first degree who repeatedly delved into his own two lungs in an effort to serve up deep and confusing psychological torrents of voice-based mash. In his unique form of fiction-making, Tazartès ends up revealing equally deep truths about the richness and strangeness of humanity. Equally remarkable to find Jac Berrocal playing on this album too. To me he’s another musical conundrum whose incredible music does not yield its secrets lightly, and I’ve been working hard at the puzzle as manifested on his 1970s Futura and D’Avantage recordings, only to find all my solutions are confounded by any subsequent revisits to those essential Alga Marghen reissues. If we’re going to allow speculative fiction, what if Miles Davis had remained in Paris in 1949 and never returned to America, truly steeping himself in the existentialist philosophy and free-thinking atmosphere? The results might be something like the muted and serpentine trumpet work we hear slithering around this Superdisque record, where the studio echo effect of Teo Macero has been replaced by the digital proxy of David Fenech’s mixing desk. Last year my Berrocal fave rave was the Hot Club LP Straight Outta Bagnolet, but there his oddly syrupy sound was dissolved and mutated into an even more glutinous strawberry parfait thanks to Dan Waburton’s far-out production on that weird group collaboration. Here, Berrocal only has one other instrumentalist to contend with (see below), and his brassy melancholic lines stand out like the cries of chimeras, unicorns and hippogriffs rescued from a mythological past and recast as sculptures in a magical workshop. You can run your fingers over the sinewy lines of Berrocal’s trumpet work as surely as you touch a Brancusi or Giacometti. David Fenech recorded and mixed this item, but he also plays electric guitar, turntables, toys, percussion and sampling, working as hard as Fred Frith did to provide the matchless instrumental backdrops for Art Bears. Presumably as founder of the trio and owner of the studio where this was made, he’s the unofficial producer of the album and may be responsible for the uncluttered sound. It’s a very direct record where studio technique has been used to a bare minimum; few overdubs, a little sparing echo. 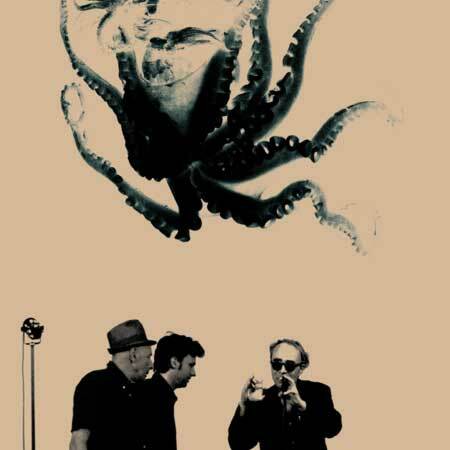 All the strangeness comes from the performances, a strangeness somehow confirmed by the surreal back cover image where the musicians appear on a blank field with a gigantic octopus suspended above them. Shared secret knowledge with Captain Beefheart. With the accordion playing on some tracks (Zap Pascal does it on ‘Porte De Bagnolet’, but elsewhere it’s Berrocal or Tazartès himself), we’re almost on safer and recognisable turf as the singer appears to be approximating a forgotten rural French folk song, occasionally even with lyrics recognisable as French on an album otherwise characterised by wordless vocalising. This has the fleeting effect of suggesting all these other fictions actually have a basis in historical reality. To bolster this impression further, there is ‘Ife L’Ayo’ which is inspired by the work of the Nigerian drummer Solomon Ilori; ‘J’Attendrai’, which derives from the singing of the pre-war chanteuse Rina Ketty; and ‘Sainte’ which is a setting of a poem by Stéphane Mallarmé, the untranslatable French symbolist. The presence of conch shells and human bones used as wind instruments is but another adjunct to this uncanny woven tapestry of half-true, half-mythological musical extravagance. Mais oui, c’est un superdisque ! En tout cas pour les amateurs du genre (sauf que ce genre n’existe pas). Ceux qui sont familiers des vétérans Berrocal et Tazartès seront aux anges car ce disque, aux confins de l’art brut (cf les expérimentations sonores d’Artaud ou de Dubuffet), du rock, du jazz, de la musique ethnique (notamment avec Powow dont le titre parle de lui-même) et de la poésie sonore, les révèle au meilleur de leur forme. Bien sûr, Ghédalia vocalise toujours dans des langues inventées (sauf pour l’amusante reprise de J’attendrai Ton Retour ou pour l’interprétation d’un poème de Mallarmé, Sainte, dans le plus pur style Dubuffet) et pratique divers instruments relativement incongrus, bien sûr Jac poursuit ses divagations à la trompette ou avec d’autres binious peu usités (tel que conques et ossements humains du Tibet), mais c’est pour notre plus grand bonheur ! Ce qui fait sans doute le ciment du trio, c’est David Fenech (qui a collaboré avec de nombreuses pointures comme Jad Fair, Felix Kubin, Tom Cora, Rhys Chatham, James Plotkin), lequel joue ici surtout de la guitare électrique (mais également de l’ukulele, des tournedisques, diverses percussions, etc. ), tout en se chargeant de l’enregistrement et du mixage dans son studio à Montreuil. La production est nerveuse et sans faille. Sur les douze titres, trois ont été enregistrés en public, sans qu’on puisse le déceler, témoin d’une bonne cohésion. L’album est traversé par des mélodies tantôt fragiles tantôt sauvages ou étranges voire cocasses, avec parfois un brin de nostalgie. La version CD contient un bonus, Zilveli, long et hypnotique duo entre Fenech (avec la même guitare delay du premier morceau, ainsi que d’autres explorations kraut de la guitare) et Berrocal. Jac Berrocal est une icône de l’underground. 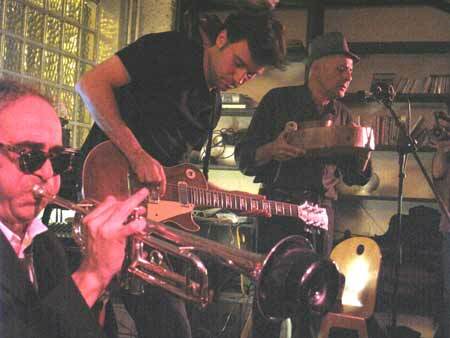 Avec sa trompette et ses idées folles, il a accompagné Marie-France, Christophe, Pascal Comelade, Jaki Liebezeit (Can), James Chance et Vince Taylor. Vétéran proto-punk, Ghédalia Tazartès est un homme orchestre aussi à l’aise avec la comédie française qu’avec les musiques tibétaines et africaines. David Fenech est le cadet de la bande, mais son cv est déjà bien rempli (musicien pour Jad Fair, Felix Kubin et Tom Cora). C’est à son instigation que l’on doit ce Superdisque (Sub Rosa) visitant les marges du rock, du punk et de la poésie sonore. La langue improvisée du trio, constituée d’onomatopées et de borborygmes, synthétise bien leur folie hypnotique. L’autre lecture de Mallarmé. L’autre monde des possibles en toute fraicheur. Superdisque can be stony-faced enough to simulate an incantatory ritual. It can also plod happily through some sort of off-kilter nursery rhyme, and completely unhinge into a delightfully wayward mesh of accordion, drums and noise. Despite these three players boasting decades of musical experience between them, each takes to the album’s eclectic, quick-shifting dispositions with untiring vivacity; the trio adapt brilliantly as the mood upturns from dreary to jubilant and back again, with playing techniques and instrument choices constantly being swapped throughout (everything from human bones to toy pianos feature in amongst the record’s eclectic instrument list). Tazartes is arguably the chief atmospheric catalyst, and his incredible vocal range – including throat singing, panicky yelps, and a particularly distinctive midrange croon – persistently pushes the music into greater eccentricity. Superdisque is all the better for it. Mit der künstlerischen Vergangenheit der Musiker, die mit “Superdisque” als Trio ihre erste Veröffentlichung präsentieren, ließe sich der Platz, den ich für diese Rezension zur Verfügung habe, spielend füllen. Berrocal und Tazartes, der eine legendärer Improv-Trompeter, der andere autodidaktischer Vokalakrobat, beide seit den siebziger Jahren aktiv, haben mit dem gut zo Jahre jüngeren Komponisten und Improvisationsmusiker Fenech eine spannungsreiche, atmosphärisch dichte Platte veröffentlicht. Vierzig Minuten Material, ausgesucht und editiert aus im Studio live improvisierten Sessions. Vom Akkordeon über Tazartes’ markante Stimme, Klangschalen, Oud, Klavier und elektrischer Gitarre bis hin zu Turntables, Ukulele und sogar menschlichen Knochen – nichts im Studio schien sicher gewesen zu sein vor der Inspiration der drei Verrückten, die eine Musik eingespielt haben, die sich Genredefinitionen entzieht und jenseits aller damit verbundenen Grenzen vor allem eines kann: für sich stehen. Vereinzelte Töne, angedeutete Kompositionen und (a)tonale Entwürfe als Ausdruck der Spontaneität, Geistesgegenwart und Unerschrockenheit von drei Musikern, die kollektiv und in einer Art kontrollierter Unmittelbarkeit ein atemberaubendes und abwechslungsreiches Album eingespielt haben. Das Trio besteht aus drei alten Recken der französischen Improvisations- und Avantgardeszene: Gitarrist David Fenech (der u.v.a. mit Felix Kubin, Tom Cora und Andrea Parkins arbeitete), Trompeter Jac Berrocal (der neben Catalogue auch mit James Chance und Comelade produzierte) und Ghédalia Tazartès, ein Mann, der das Akkordeon genauso schräg bedient wie seine Stimme. Die “Superdisque” liegt für Sub Rosa-Verhältnisse ungewöhnlich dicht am Jazz: die Trompete gleitet in bester Stanko-Freelectronic-Manier über den Seltsames verkündigenden BrabbelOpa, knarrend schwingende Baßsaiten oder surreale elektronische Einschübe und Versätze und bildet so ein Gesamtkunstwerk 2. Ordnung, das sich dem Normalsterblichen erst später erschließt. Schrag-avantgardistische Improvisation ist das Metier der drei quirligen Franzosen. David Fenech, der Gitarrist im Bunde, musizierte schon mit Tom Cora und Felix Kubin. Trompeter Jac Berrocal produzierte unter anderem keinen Geringeren als James Chance und last but not least Sanger Ghédalia Tazartès, dessen lautmalerische, fast indianisch arunutende Gesânge einen leichten Faible zur schauerlichen Dramatik besitzen. Das sich formidabel erganzende Trio produziert eine durchaus- interessant vielschichtig jazzige Kakophonie des Wahnsirms. Une des plus belles choses que j’aie entendu ces dernières années. C’est rare et très bien enregistré. D’une richesse sonore et d’une finesse absolument incroyables. Blaise Merlin – France Musique , Des nuits noires de monde , April 29, 2012. Der Gitarrist DAVID FENECH, Jahrgang 1969, ist trotz all seiner schrägen, d.h. genau richtigen Connections zu Jad Fair, Felix Kubin, Ergo Phizmiz, Falter Bramnik, seiner Beteiligung bei Tributes zu R. Stevie Moore, Pascal Comelade, Moondog, Art’s Birthday, Insekten oder Spielzeug, mir bisher nur mit PopeWaffen ins Netz gegangen. Das ändert sich nun mit Superdisque (SR321), als Meeting mit JAC BERROCAL und GHEDALIA TAZARTES freiweg der kultigsten Scheibe der Saison. Tazartès entfaltet in 12 Songs sein ganzes uriges und superpoetisches Wesen, mit einem jammervollen ‘J’attendrai’, dem Chanson- klassiker von Rina Ketty, ‘Ife L’Ayo’ nach einem ohrwurmigen Thema des nigerianischen Trommlers Solomon Ilori oder ‘Sainte’ nach einem Gedicht von Mallarme. Dazwischen singt, krächzt und zungenredet er auf Tazartisch, und Berrocal bläst dazu Trompete, eine Muschel, sogar eine Knochentrompete, oder spielt Akkordeon. Fenech mischt neben der E-Gitarre auch Turntables ein, zupft Ukulele und Oud. ‘Joy Divisé’ und ‘Human Bones’ zeigen gleich zu Beginn die ganze Phantastik dieses Trios, kehlige Imaginäre Folklore, kaskadierende Bassnoten und Rückwärtsgitarre, schweifende Luftschlangen und blitz- schnell wechselnd schrille und melodische Trompetensounds, bis zum Aufrauschen sämtlicher Gitarreneffekte und bloßem Geknurre und Gefauche der Trompete. Ist Tazartès da noch ein tibetischer Mönch, verwandelt er sich für das rituelle Tamtam von ‘Cochise’ und ‘Powow’ zum Indianermedizinmann. Bei ‘Quando’ greift er zum Akkordeon und stimmt zu Ukulele und Toypiano ein Lied an, das wie von 1000 Herbsten gegerbt klingt. Das melancholische ‘David’s Theme’ krächzt er wie ein Schubert-Lied auf Jiddisch. ‘Porte de Bagnolet’ löst die Liedform gänzlich auf in eine musikalische Skizze aus Vokalisation, Trompete und Akkordeon, Tamtam und Klimbim. Trompete, Whistling, Chimes und Gamelan bestimmen ‘Jac’s Theme’, bis sich Tazartès mit gutturalstem Knurren einmischt. Bei ‘Final’ umschwärmen gleich zwei Akkordeons einen jubelnden Gesang, eines quiekt wie eine alte Hube, während Tazartès die Bendir klopft. Eine befremdlichere, erstaun- lichere und dennoch urvertraute und berührende Musik ist kaum vorstellbar. Als Nach- schlag erklingt noch ‘Zilveli’, ein prachtvoller Liveclash nur von E-Gitarre und Trompete, die dabei per Delay und Echo Junge bekommen. Bad Alchemy – no 71, Jan 2012. Superdisque, voilà un nom tout trouvé pour la (première) collaboration de trois originaux mélangeurs de rythmes et de mélodies : Jac Berrocal à la trompette, David Fenech à la guitare électrique, et Ghédalia Tazartès au chant… Trois enfants de chœur qui s’amusent avec les structures, donnent dans la trompette cinoque, l’accordéon dégonflé, l’esbroufe vocale, le langage improvisé et l’improvisation langagière… Ian Curtis de division d’honneur (Joy Divisé), hurluberlus qui trouveraient bien dans leurs auditeurs plus remué qu’eux, poètes usés jusqu’à la rime, folkeux qui ont tant de référence qu’à la fin ils n’en ont plus (Cochise, Quando…), urbains cherchant l’herbe sous l’asphalte, équilibristes sur fil dentaire, bois sans soif et chante sans refrain, arpenteurs de vide-greniers… Ces musiciens-serpents qui sifflent sur Superdisque sont tout ça à la fois. Et voilà maintenant que vous sifflez avec ! I bought your LP with Tazartes and Berrocal today. It’s wonderful ! Congratulations David!